To promote responsible and sustainable tourism a meeting regarding ‘Relocation at Pangong Lake and Chaddar Trek Regulation’ was held with all the stakeholders at Council Secretariat on October 12. Following the guidelines of Hon’ble Supreme Court, issues regarding the demarcation of the appropriate site for relocation of commercial establishments like camps, resorts, shops and other tourist-related units; scientific ways to dispose-off toilet waste and garbage, and other related issues were discussed in detail with all the stakeholders. 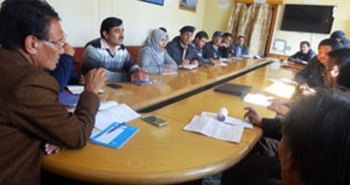 Hill Council, Leh has formulated a comprehensive proposal for allotment of lands for the locals of each village to establish their business at a new place maintaining the mandatory distance from the lake. He further assured that decisions will be taken by taking the native people in confidence for their every possible benefit. Dr. Sonam Dawa, CEC gave instructions to the concerned departments for preparing strict guidelines for tourists pertaining to the Pangong Lake, ascertain distance for parking area from the lake, proper registration process, issuance of notice to illegal business set-up, increase in the number of police personnel, continuous vigilance by eco-guides, and other issues. He also suggested for making the surrounding villages of Pangong lake eco-model villages by generating electricity by setting up a solar power plant. He, therefore, instructed LREDA to start the work in this direction. In the meeting, it was suggested that hoardings reading important guidelines for tourist destinations must be displayed from the airport and at important tourist spots. On the request of the travel & trade association and the general understanding of the tourist season in Ladakh, CEC gave assurance of completion of work of demarcation of place by the end of this month so that the travel and trade personnel get ample time to set up their business unit well in time for the next tourist season. It was also decided in the meeting that final decision of the same will be decided on DC Leh’s visit on spot in a short period of time. The Pangong Lake area has been declared as Cold Desert Sanctuary by the Govt. of India and the Hon’ble High Court has already issued an order for removal of all those illegal business establishments from the close vicinity of Pangong lake. Similarly, the Hon’ble Supreme Court of India has also declared the area as Cold Desert Sanctuary in 1987 by issuing strict instructions not to disturb the lake area and the endangered wildlife species living and breeding there. Regarding Chaddar Trek Regulation, Dr. Dawa talked about setting up of portable toilets at various night-halt spots at Chaddar Trek which later will be maintained by the people of Zanskar and therefore gave directions to EC Tourism and representatives from Zanskar and ALTOA to work in cooperation in this regard.